Were you one of the thousands of people who voted Little Mix into first place in the 2011 X Factor final? Did you follow their amazing journey from unknown wannabes to become the first group ever to win the popular TV talent show? Would you like to find out more about this exciting new chart topping girl band? If so, The Little Mix Quiz Book will tell you everything you need to know. Can you name all four band members? How many people tuned in to see Little Mix win The X Factor final? What was the name of the show that Little Mix performed at during January 2012, to help raise money for breast cancer? The answers to these questions and more are all in this fun quiz book.Full of information all about Little Mix, including many personal details, you are certain to learn something new about your favourite X Factor band. 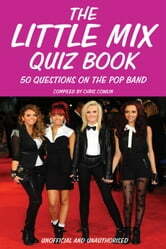 This is a must-have book for anyone who likes Little Mix and X Factor fans of all ages. What Car Would You Drive If ... ?